Militants loyal to Abu Musab al-Zarqawi said Saturday they have kidnapped three Turkish workers, and they threatened to behead them in 72 hours, heightening tensions as President Bush visited Turkey. In new violence, a booby-trapped car exploded Saturday evening in a crowded commercial area of Hillah, a largely Shiite Muslim city south of Baghdad, killing 19 people and wounding around 60, a senior Iraqi police official said. The official described the blast as a vicious attack on innocent Iraqi civilians. The bloodshed and the latest in a series of abductions claimed by al-Zarqawi's movement - which has beheaded two previous hostages, an American and a South Korean - threatened to cast a shadow over a NATO summit opening in Istanbul Monday, where Mr. Bush is seeking the alliance's help in stabilizing Iraq. The kidnappers demanded that Turks hold demonstrations protesting the visit by the "criminal" Bush and that Turkish companies stop working in Iraq, or else the hostages would be killed. In central Baghdad, insurgents killed a U.S. soldier in an attack on a patrol Saturday, the military said. Gunmen launched new attacks in the city of Baqouba, northeast of the capital, sparking battles that killed six insurgents and three civilians. The violence came two days after fighters loyal to al-Zarqawi launched a coordinated wave of attacks across the country that left about 100 people dead, including three Americans. The insurgents battled with U.S. troops, who eventually regained control. The attacks are meant to undermine confidence in the interim Iraqi government, which is set to take power Wednesday. In victories for President Bush, the United States and European Union agreed at a summit in Ireland Saturday to back Iraq's urgent request for NATO help in the training of Iraqi security forces. NATO ministers meeting in Turkey then reached initial agreement to go along. But there were large protests in Ireland and Turkey against the Bush administration's Iraq policies. Interim Iraqi prime minister Iyad Allawi told CBS News Correspondent Dan Rather Saturday that national elections set for January 2005 could be delayed if security is not established in the volatile country. Iraq's interim constitution says elections for a national assembly must be held by Jan. 31. But Allawi said they could be delayed for up to two months. Repair crews patched up the larger of two southern crude oil pipelines damaged by saboteurs and resumed pumping to offshore terminals, an official with the South Oil Company said Saturday. The smaller of the two main export arteries came back on line Monday. The damage to the two lines essentially cut off Iraqi oil exports earlier this month. But hours after the pumping resumed Saturday, attackers blasted a small pipeline that feeds into domestic storage tanks, igniting a blaze, Iraqi police said. The impact of that explosion was unclear. A third, smaller line linking the northern oil fields of Kirkuk with the Turkish port of Ceyhan, was repaired earlier this week after being knocked out of service by attacks last month. The United States has recently issued about 55,000 armored flak jackets to Iraqi forces, a senior U.S. commander said to The Associated Press on condition of anonymity. 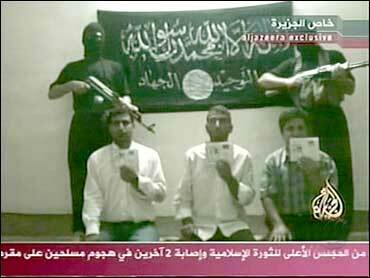 The Arab television station Al-Jazeera aired a video issued by the purported kidnappers, showing the three Turks kneeling on the ground in front of two black-garbed gunmen and a black banner emblazoned "Tawhid and Jihad," the name of al-Zarqawi's organization. The men held up Turkish passports. In a written statement, the group demanded Turkish companies stop doing business with American forces in Iraq and called for "large demonstrations" in Turkey against the visit of "Bush the criminal." It said that if Turkey refused their demands the hostages "will receive the just punishment of being beheaded." The station received the tape Saturday, an employee at the station told The Associated Press. The message did not say when or where the three were abducted. It appeared the deadline was Tuesday, but the message did not specify what time it runs out. The three men disappeared two days ago, said a Turkish consular official in Baghdad who asked to be identified only by his surname, Gungor. He said he had no further information. The abductions are likely to stoke anti-war sentiment in Turkey, where Mr. Bush is already extremely unpopular. Hours ahead of Mr. Bush's arrival in Ankara, police battled scores of protesters Saturday, eventually firing tear gas to disperse them. News of the new abduction came just as the body of Kim Sun-Il, a South Korean worker decapitated by al-Zarqawi's followers last week, were brought back to his hometown, Busan. His slaying has prompted nightly vigils in the Korean capital, Seoul, urging the government to call off its plans to send 3,000 troops to Iraq beginning in August. Last month, al-Zarqawi's group claimed responsibility for the beheading of American businessman Nicholas Berg. The explosion in Hillah, 60 miles south of Baghdad, came Saturday evening outside the former Saddam Hussein mosque, said Lt. Col. Robert Strzelecki, of the Polish troops patrolling the city. The U.S military said a bomb, "possibly vehicle borne," detonated, and "initial reports indicate 17 Iraqi civilians were killed and as many as 40 civilians were injured." Elsewhere, a car bomb exploded in the Kurdish stronghold of Irbil in northern Iraq, killing one person and injuring 18 people, including the culture minister of the pro-American Kurdistan Democratic Party. In Baqouba, gunmen attacked the offices of two political parties and other buildings. Insurgents hit the offices of the Supreme Council of the Islamic Revolution in Iraq - one of the country's biggest Shiite parties - with shoulder-fired grenade-launchers, said party member Maitham Ibrahim. Three party members died and two were injured, hospital officials said. Gunmen also overran the offices of Allawi's political party, the Iraq National Accord, setting off an explosion that sent smoke and flames leaping from the building's third-story windows, witnesses said. No one was hurt. U.S. Maj. Neal O'Brien, spokesman of the 1st Infantry Division, said four guerrillas - one wearing an explosives-packed vest - also attacked Baqouba's blue-domed government building. Guards fired back, killing the four, he said. Two other insurgents died in an attack on a police station, O'Brien said. In Mahmoudiyah, 20 miles south of Baghdad, insurgents killed two Iraqi National Guardsmen in an ambush. Another police officer was killed in a separate attack there, said the director of the Mahmoudiyah general hospital, Dawoud al-Taei. In the capital, gunmen attacked a police station in the New Baghdad area but officers fought back in a rare show of force. The attackers fled, and police arrested three Iraqis, an Interior Ministry official said.